At a recent International Food Technologists Expo, the trend in real fruits and vegetables as flavors, colors and textures showed up chews, powders, crunchy stuff and everything in between. Here are just a few suppliers of fruit- and vegetable-based food ingredients that food and beverage makers, food service chefs and restaurants can look to in the quest to eliminate artificial colors, flavors, and preservatives from recipes. Graceland Fruit and the Shoreline Fruit Cooperative harvest the fruits of Michigan to produce a range of natural fruit ingredients, snacks, and inclusions. The Shoreline co-operative totals 6,000 acres of fruit trees from which the co-op harvests 25 million pounds of Montmorency tart cherries a year. Product offerings: Dried fruit blends, cherries, apples, blueberries, cranberries sweetened and unsweetened as well as cherry concentrate and frozen cherries (and many more types of Michigan cherry products). Of special note: Tart Cherry powder which is free from artificial colors, flavors or additives which can be used for foods, beverages, beverage mixes, and nutraceuticals. Drago Natural Products' offers a 700-product line of "Full Spectrum Standardized Herbal Extracts." The Certified organic "natural beneficial purple pigments" line includes vibrant water-soluble extracts, in powder form, made of purple sweet potatoes, black currents, beets, black raspberry, mulberry and other fruits. Tradin Organics offers organic fruit and vegetable juice concentrates, purees and other ingredients sourced from around the world. Their line also includes oils, nut butter, cocoa and more. For spice mixes and prepared foods, Silva International makes a line of roasted organic fruit and vegetable powders as well as almost every dehydrated flaked, diced, granules, powders and blends of fruits, herbs, and vegetables you can imagine. Their facility is in Illinois. Some major chocolate companies in Europe look to German company Jahncke for their freeze-dried fruit ingredients, used in chocolate bars. At the show, the freeze-dried fruit squares shown in the photo delighted us. Crunchy like honeycomb candy, they have real fruit flavor and real potential as a component in a snack mix. Of special note: Fruit juice drops made with around 80% fruit juice and shaped chewy fruit "candies" made from fruit purees and juices — with no added sugar. 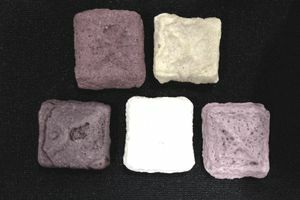 High Brix Pastes and Fruit Granulates give food manufacturers flexible and interesting inclusions for pastries, candies, etc. At Expo West, Powder Pure's bright and tasty fruit powders impressed me. They're ripe for a new generation of candies and other desserts that leave out the bad stuff. Van Drunen Farms in Illinois and a number of Oregon fruit producers add to the possibilities for sourcing good, clean, tasty ingredients. Ciao ciao, Red Dye #40! What a no brainer, for fruit growers and bakers and candy makers. Oregon Fruit (the brand with the fun vintage cans in supermarkets) has enjoyed ongoing success with its fruit purees for food service, including creating specialty purees for the craft brewing industry. In fact, the "fruit for brewing segment" of the business has been growing 100% month-over-month for the past year via word of mouth among craft beer brewers. Oregon Fruit also offers frozen strawberry, raspberry, and blueberry Pourable Fruit, from American growers in Oregon and around the United States. They manufacture the pourable fruit sauces using a process that maintains naturally strong fruit flavor and vivid fruit color. It is only lightly sweetened using non-GMO cane sugar to enhance the fruits’ natural sugars. Perfect Purée of Napa Valley has a long-time reputation for their delicious, real fruit purees, fruit concentrates, fruit zests, and blends in classic, single fruit flavors like Red Raspberry, Mango, and Strawberry. They also offer more exotic, complex purees such as Caramelized Pineapple and Thyme & Citrus. The company's loyal customers include restaurants, bakery, hotel, catering kitchens, and bars as well as food producers. The products are available through a network of over 180 food service distributors throughout the United States, Canada, Mexico and the Caribbean. Learn more about Perfect Purees of Napa Valley. Seeking Natural Colors and Flavors? Here are sources of preservative free fruit and vegetable powders and dehydrated bits — seriously, before you choose artificial flavors and colors, see all the natural options! How do QSR, Casual Dining, and Fast Casual Restaurants Differ?